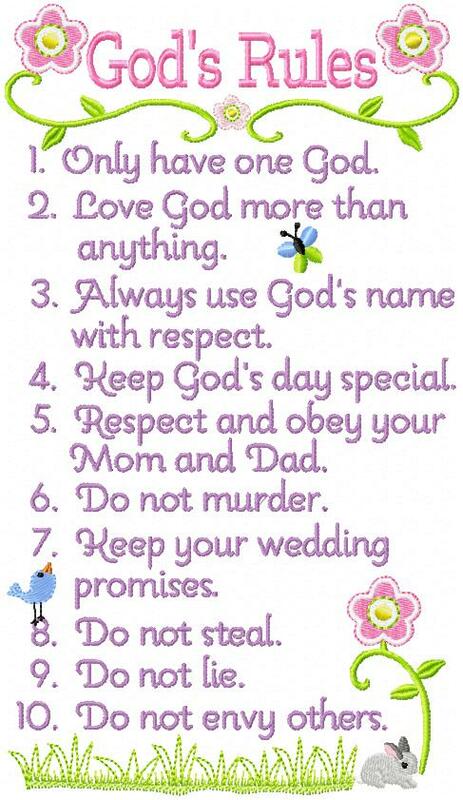 As you may know, I have been working on different embroidery versions of the 10 Commandments for children. I have really sensed a great need to do this being that the 10 commandments have all but disappeared out of the public eye. This morning our daughter Kristy told me a story about her Saarah. Kristy and family have just moved into a new home – it’s a lovely home, about 5 yrs old. The children love their new rooms and beds but Saarah was unhappy that her sister had a different and more “puffy” looking mattress. After listening to her complaining for a while, her Daddy took her aside and talked to her. He told her that there are many homes fancier than the one they had just moved into but that he, Brian, wasn’t going around complaining about not having one of those homes but rather that he was thanking God for the lovely home He had given them. Saarah became quiet and suddenly said “Wait, Dad, isn’t that one of those of God’s rules that Grandma showed me on her wallhanging? The one about envy? That means I sinned and I better ask God to forgive me. And with that she went to her room to do just that. 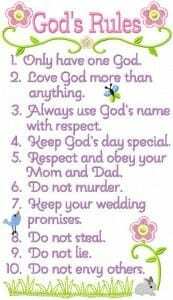 I want to encourage you to teach your children the 10 Commandments while they are young. Scripture tells us that we should “train up a child in the way that he should go, and when he grows old he will not depart from it”. Give your children and grandchildren a moral and spiritual basis for living while you can. Of course, you don’t need my embroidery design to do that with. They are just one of many tools available to you to teach your children about the things that matter in life. Thank you for letting me share this story that has touched my heart this morning. I hope it touches yours, too. I LOVE your God’s Rule design, where can I get it? I have been unable to locate it. I am making grandbaby items and I have to have this one. Thanks.